A reader asks: what’s happening in East Harlem on Lexington Avenue between 100th and 101st Street? | HarlemGal Inc. This entry was posted in business, Community, Harlem, Harlem blogs, Harlem businesses, Harlem commercial real estate, and tagged 10029, commercial real estate in Harlem, East Harlem, Harlem, Harlem Blogs, Spanish Harlem. Bookmark the permalink. Not sure what is happening on that block overall (except Joy Burger is thriving), but I was very upset to learn two weeks ago that YoIn YoOut shut it’s doors due to bankruptcy (http://bit.ly/14r6A4m) at the beginning of July. There are also stickers on the former Giovanna’s windows that say ‘seized’ (that space has been vacant for a few years) so it would seem that it is the independent financial situations of the restaurants that is causing the vacancies. However, Izocan Bistro, which used to be on the south side of that same block also closed back in 2011, which makes the amount of closures on that block very unusual. That being said, perhaps the landlord(s) were motivated to hike up the rent come lease renewal time, and the restaurants that had been part of a thriving restaurant oasis on Lex before anyone else was brave enough to open up got priced out of their very own block that helped Put East Harlem on the food map. 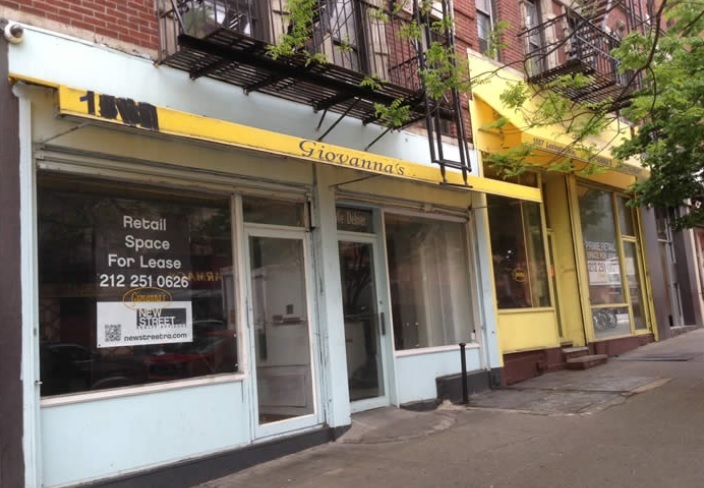 Rental prices for these store fronts have risen. Pricing that you would normally see in the upper 80’s is what your starting to see in that area. The difficulty is that small business owners are unsure if the investment will pay off, but I believe the answer your looking for is with the rise in rent prices. We are currently marketing all the spaces on Lexington Avenue between 100th and 101st Street. Please follow the link to our website for all detailed information about these spaces. All spaces are currently on the market for lease: Itzocan Bistro, Giovanna’s Pizzeria, Yo In Yo Out, and La Gallete. The Landlords of this building are really looking to change the neighborhood (for the better) and put some quality tenants in the building. Ownership is willing to consider all uses. We believe the best uses for the spaces are: restaurants, offices, day care centers, schools, cleaners, wine bars, and fast casual food concepts. Contact New Street Realty Advisors with any questions: 212-644-5015.